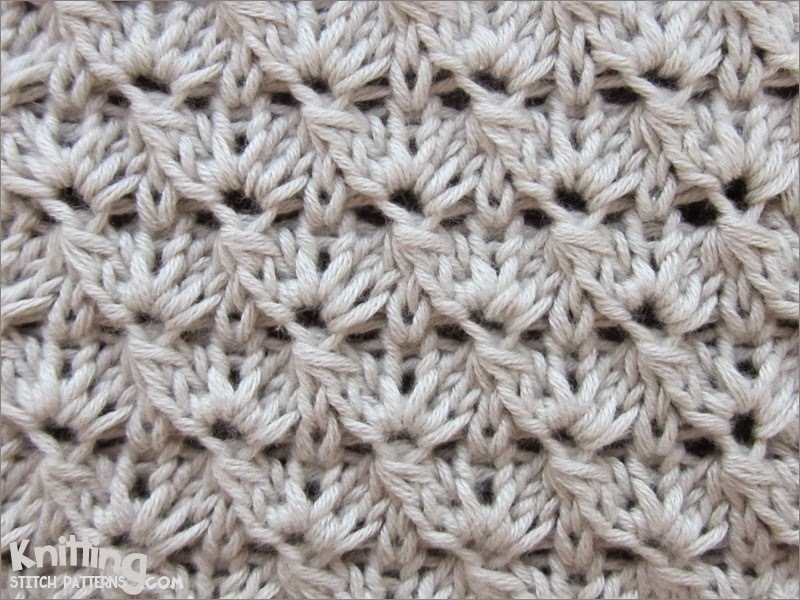 The Cluster stitch looks like a crochet pattern. This knitting stitch is an 8 row repeat and is knitted in a multiple of 6 stitches plus 1. Slip 4 stitches as if to knit, knit 1. Then one by one, pass each slip stitch over the knit stitch and drop it. Row 3: Knit 1, * Cluster; knit 1; repeat from * to end. Row 4: Purl 1, * [purl 1, (knit 1, purl 1) twice] all in next stitch, purl 1; repeat from * to end. Row 7: Knit 4, * Cluster, knit 1; repeat from * to last 3 sts, knit 3. Row 8: Purl 4, * [purl 1, (knit 1, purl 1) twice] all in next stitch, purl 1; repeat from * to last 3 sts, purl 3.